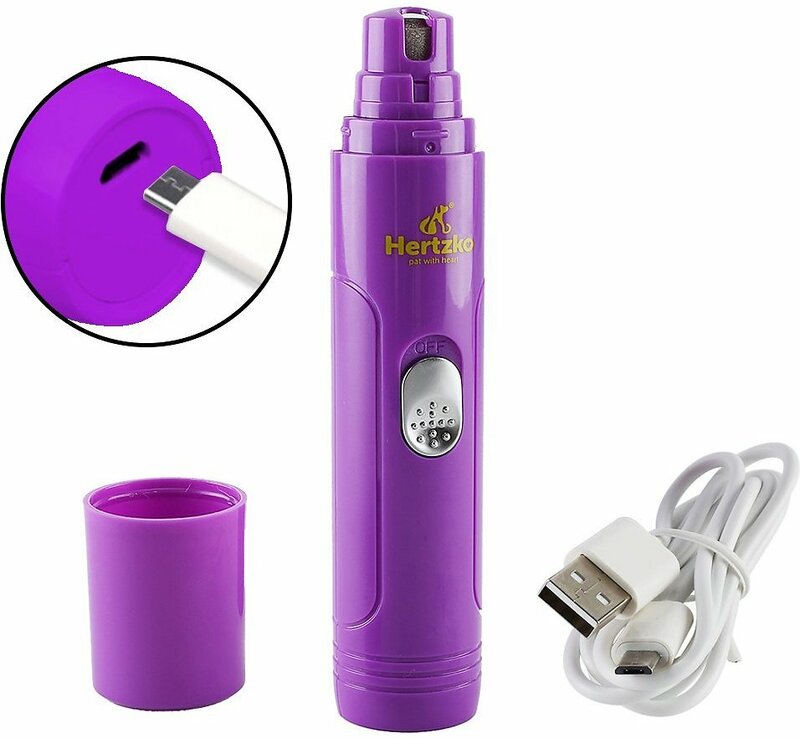 Put down the nail clippers and pick up the Hertzko Electronic Nail Grinder with USB Charger. Because let’s face it, most animals don’t enjoy nail grooming, and this tool is designed to make it as pleasurable as possible. Using a Diamond Bit Grinder, it’s safer and more effective than a traditional clipper because it reduces the risk of going too short. And since it comes with three size openings to accommodate all pet sizes, you only need one, even in a multi-pet household. 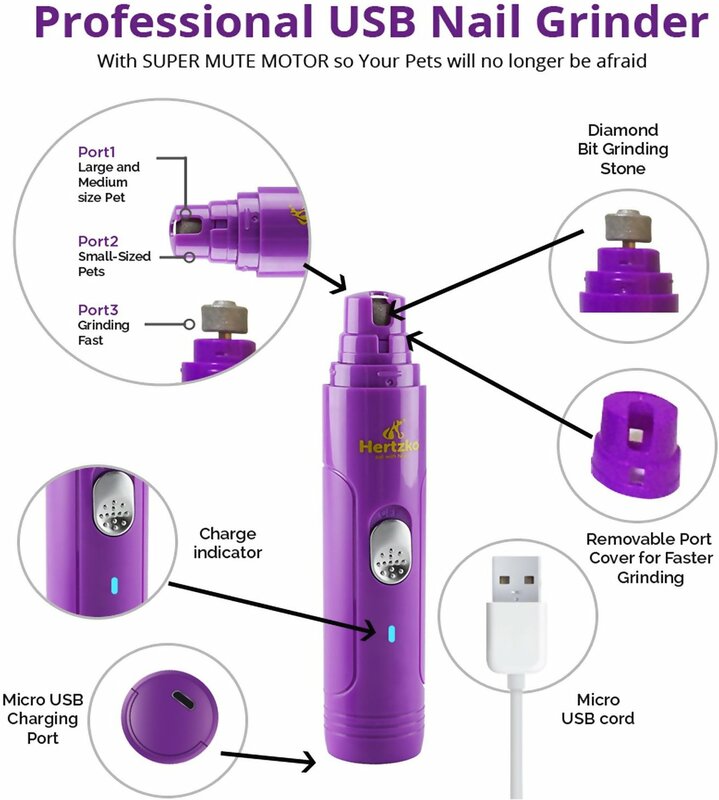 The super mute motor gives off little noise and vibration, which puts animals at ease so you can quickly get it over with and go back to the fun stuff. Electric grinder uses a Diamond Bit Grinder that is safer and more effective than clippers. Never again clip too short and cause pain or draw blood. Comes with three size openings to fit small and medium pets. For large pets, simply remove the cover to expose the entire bit. Specially designed with a super mute motor for low noise and vibration, which helps to remove the fear and resistance from pets. Easy to clean and ultra-portable, and it comes with a USB wire so you can recharge just about anywhere. 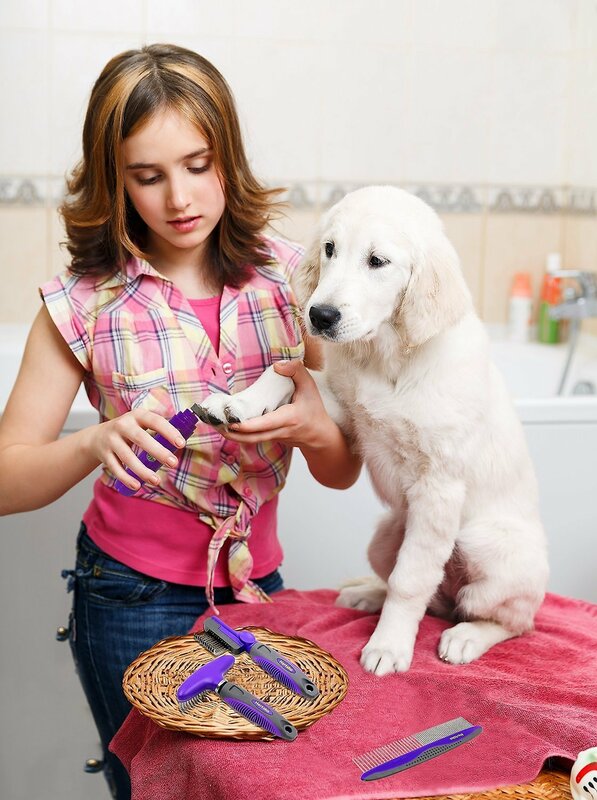 Gentle and painless grooming for all types of animals, including dogs, cats, rabbits, and birds. Electric Grinder and USB Wire for recharging. To trim your pet’s nails, place his paw in your hand and hold each toe with your index finger and your thumb. Do not squeeze the toe, but hold it firmly. Hold the nail grinder with the other hand. This position will give you more precision and prevent you from cutting the nails too short. Would give this 5 stars if they offered replacement heads. While it's clear the head will last for a long time since it's a diamond bit head, it's ridiculous to think it will last "forever" as they state. I'm noticing wear on mine already. In hindsight, the Dremel 7300-PT is worth $7 more for this reason alone. Companies forcing buyers to dump otherwise perfectly useful product into landfills by refusing to provide replacement parts is poor practice. They hope you'll be buying another Hertzko grinder when it does wear out. Not happening. Another sale lost since I was planning to buy my parents one for their dogs before I discovered the issue. I have a Siberian Husky and the Hertzko works so well on her nails. No more taking her to the groomers just to get a nail trim. I have no idea why a couple of other reviewers said it did not work for their large dogs with thick nails. I can see the nail dust and the nail getting shorter in a matter of seconds. I use it at night when she's sleepy and then she's more compliant. It was very easy to use on our two rescued cats. It takes two of us (hold them still while the other dremels their nails). It is very quiet & we only took off a small amount - worried about sanding down too far. I think after a couple of uses, we will get the hang of it. Highly recommended. Unless you and your dog have a lot of time and patience, this doesn't have the capacity to take on dogs with longer and stronger nails. I got this for my dachshund's nails, which tend not to grow as quickly. This works okay for him since I'm usually not trimming off much, but it's not nearly as fast as the Dremel I use for my pit bull's nails. The only nice thing about the Hertzko one is it leaves the nails much more polished; the Dremel is quite rough. So now I use the Dremel first, and follow up with this one to round off the nails. I have three small dogs that I do nail trimming for. And two of them have black nails on all or a few of their nails. This is a wonderful instead of using the nail clippers that I used to use. OMG it is wonderful. No more dog growling at me when I try to do their nails. Never had they bitten me but they can feel when the clippers get to close. And always had let me know. Now I can see how far down the nails are and adjust them as needed. I get them filed lower too which lasts longer between filing. I love this product. I've had a little over a month and I don't know about how long it will last but well worth having happy dogs. Thanks Chewy great product. I bought this nail grinder because my Yorkie hates to have her nails cut. This grinder is easy to use and very quiet. It doesn't scare or upset my dog. It's tough to know how much nail to grind off and how often to do it. I'm just gonna take off alittle at a time and just do it more frequently. I have a 35 lb beagle terrier mix who is ALWAYS running around outside so her nails arent that long. Last time i took her to petsmart, they filed them instead of cutting them so I thought i could do the same with this. Works better without the guard than with it. Unfortunately, it would probably take FOREVER to do her front nails alone! Neither I nor the dog has that much time or patience.